Animation Backgrounds: WHO FRAMED ROGER RABBIT? WHO FRAMED ROGER RABBIT? 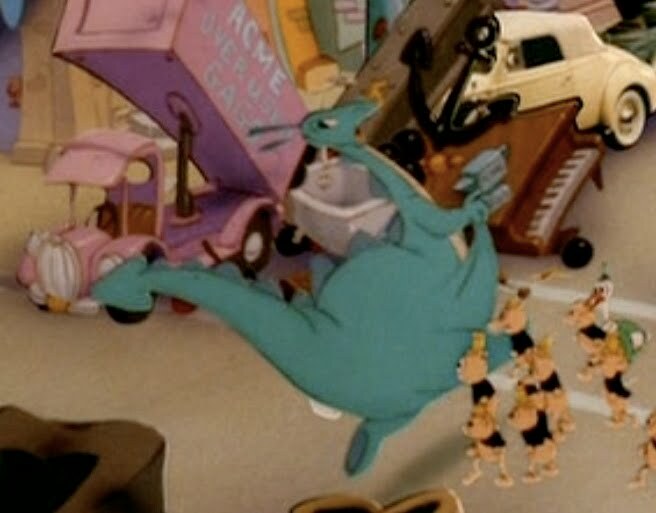 featured a perfect storm of talent and creativity at the end of the 1980s, as Disney re-invented animation and rightfully reclaimed their position as number one. 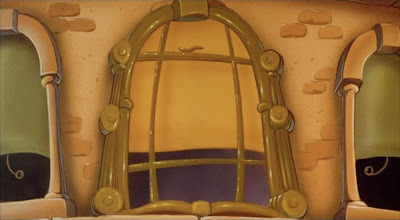 Steven Spielberg joined with Disney, and cartoon characters from Warner Brothers and other studios were licensed to appear in this spectacular toonfest the likes of which we've never seen... and will probably never see again. This post features artwork from the incredible film. You can see the care and attention to detail in this movie. It's amazing how artists' work can be overwhelming and difficult, yet fun at the same time. (Been there. done that!) The artwork is gorgeous, meticulously crafted, with a wide range of styles. A huge bonus is the inclusion of so many clever ideas and toon references tucked into the artwork in the film. Let's take a look! And don't forget to click on the images below to see the large versions. 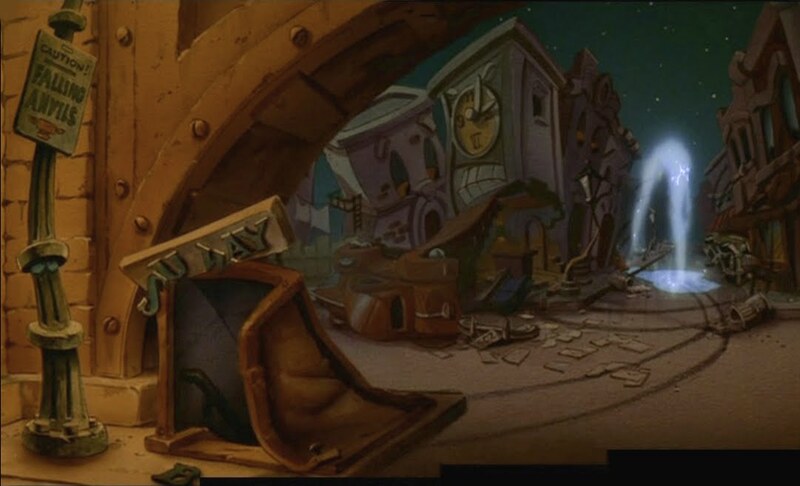 The first set of background art is from the Roger Rabbit cartoon which opens the film. 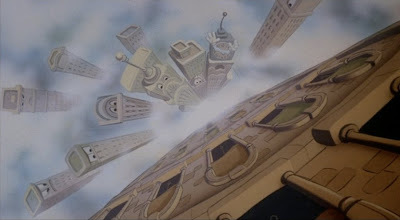 Look at the eye-grabbing perspective in this one! 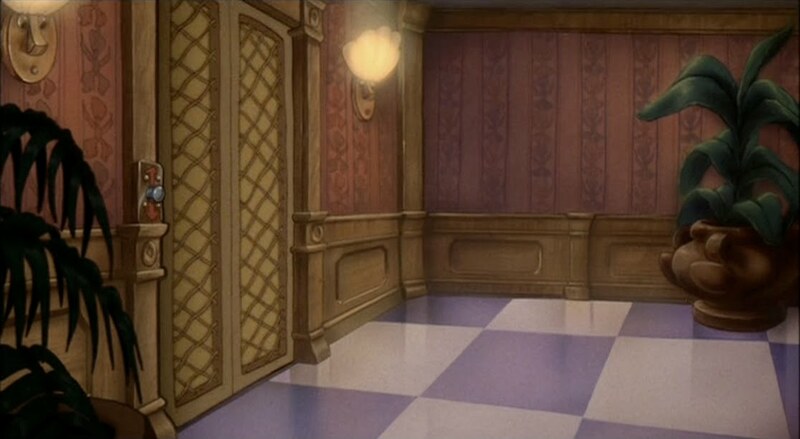 Here's a digitally recreated pan B/G... Roger Rabbit's living room. What is Baby Herman up to in the kitchen? Let's get a better look at that kitchen. Dazzling! Here's a "soft spot" for Roger to relax. It doesn't last long. What a delightful, clean "stage" for Roger's Tex Avery inspired takes! 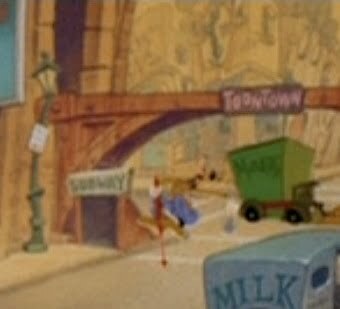 Now - it's off to TOONTOWN! It took several hours to digitally clear this wonderful B/G. 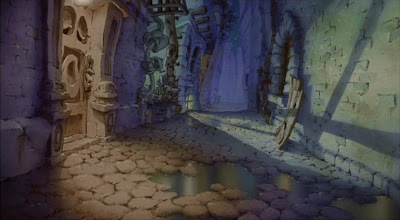 If you remember the sequence, you'll remember there are characters crawling all over the screen. Here for the first time you can see the fantastic B/G devoid of all that commotion! In a startling departure from our usual "backgrounds only" norm, let's look at some of the characters that appear in this sequence, starting off with Snow White and the old hag. They walk right past a cartful of "wishing apples" on their way into the corner market named Cindy's (short for Cinderella, I'll bet!). Six of the seven dwarfs emerge from the subway! 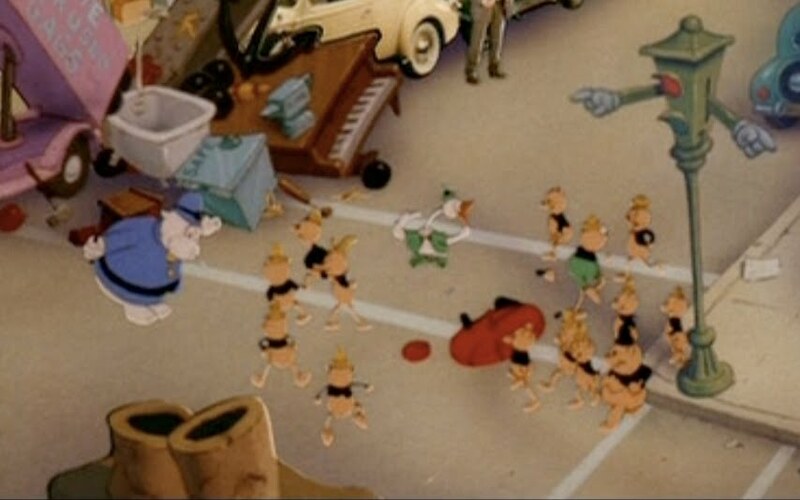 I wonder where Dopey is, what he was up to, and why he wasn't with the rest of the little men? Goofy appears not once, but twice! 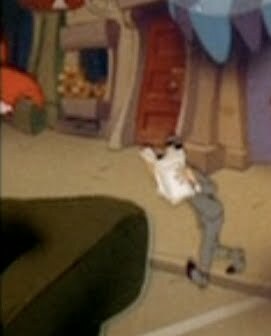 First as "George Geef," the 1950s "everyman," with his nose buried in a newspaper while crossing the street. 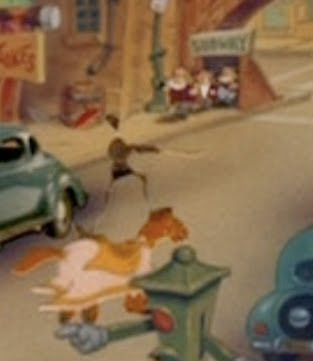 You will have to look very closely - but I'm pretty sure this is Goofy on a pogo stick! 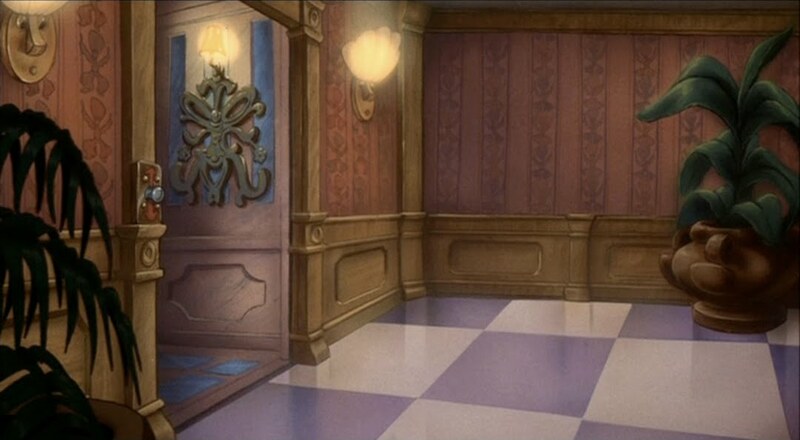 Now we'll venture further into Toontown. Even windows are a showcase for stylish design! What a handsome elevator button! Here's the elevator with the door open and closed. Notice the personalization - faces appear everywhere - in the lighting fixtures, the elevator button... even the plant pot! This bedroom is full of intriguing detail. 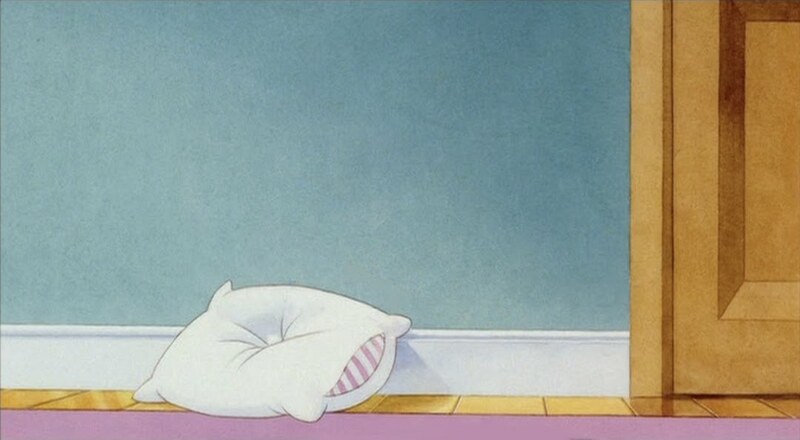 Look at the face on the bed's footboard! Check out the "toon glove" drapery ties. 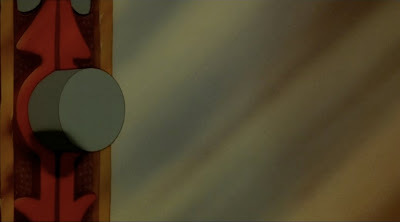 What is up with that beaver painting? 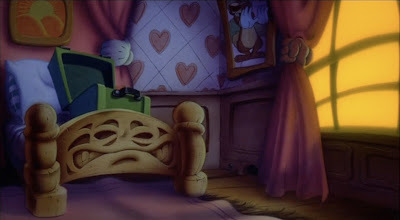 And the phonograph player on the bed? 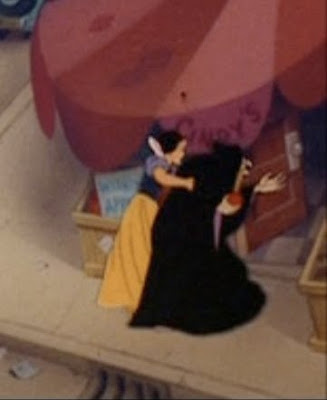 And... did you notice the mouse hole??!!! 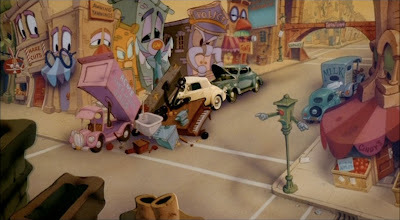 This street scene is cartoon art at its tooney best! 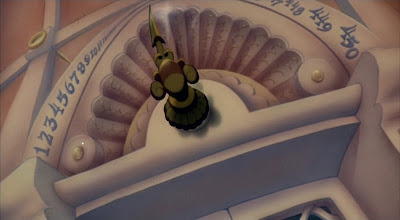 Look at the "faces" in the architecture... even the box office. 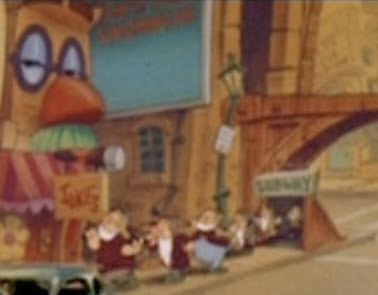 And notice "Willy the Giant" is appearing at the theatre in "Fun And Fancy Free." 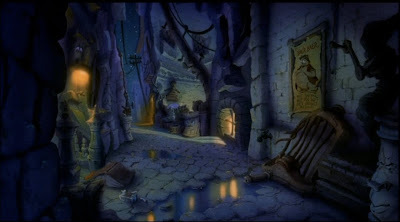 Even the dark alleys are eye candy, if a bit ominous... and again, look for the "faces." 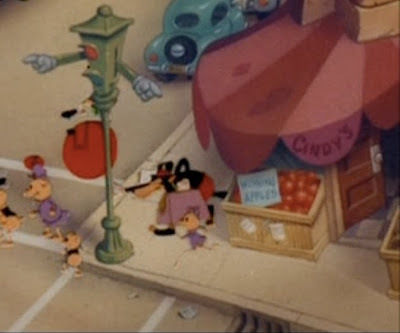 Here is a Toontown street. Lots of marvelous details... including the face in the barrel! Notice the subway portal... there's another (different) version of this street coming soon. 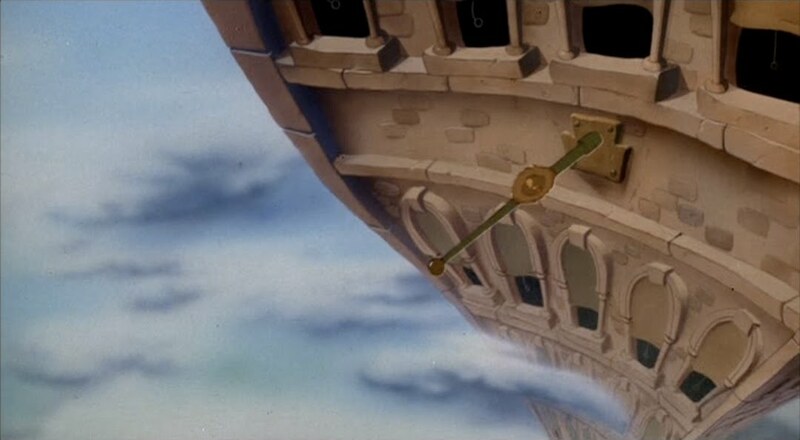 Also notice the sign "Caution - Falling Anvils!" Here's a closer look at the left side store window. Dopey's got his own clothing line. 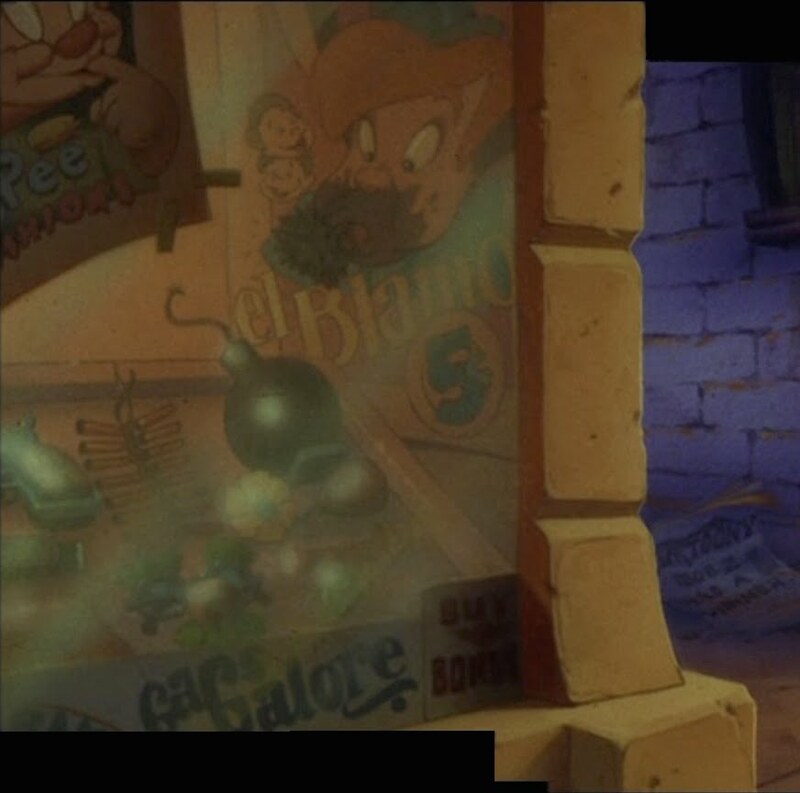 And Lampwick (from Pinocchio) is the poster boy for BLAMO exploding cigars, and he's wearing his! The window signs promise "Gags Galore" and promote buying bonds. 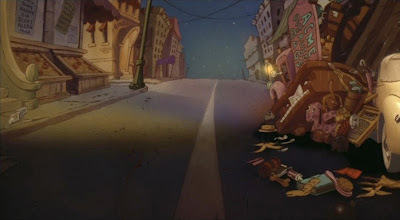 Look at CARTOONY, the Variety-style newspaper in the alley - the headline reads "Bob Z (as in Zameckis) has a winner!" 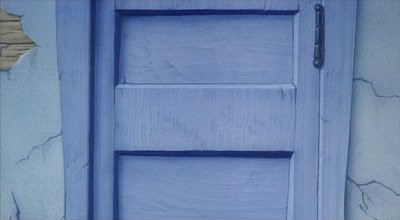 Look at the PHENOMENAL detail in this B/G. That appears to be a real car trunk embedded in the toon world... along with a junk truck overflowing with "ACME overused gags." various banana peels and a rubber chicken! Here is the afore-promised second view of the street with the subway portal and the cautionary anvil warning sign. This one opens onto yet another Toontown street. Here's a closer view. 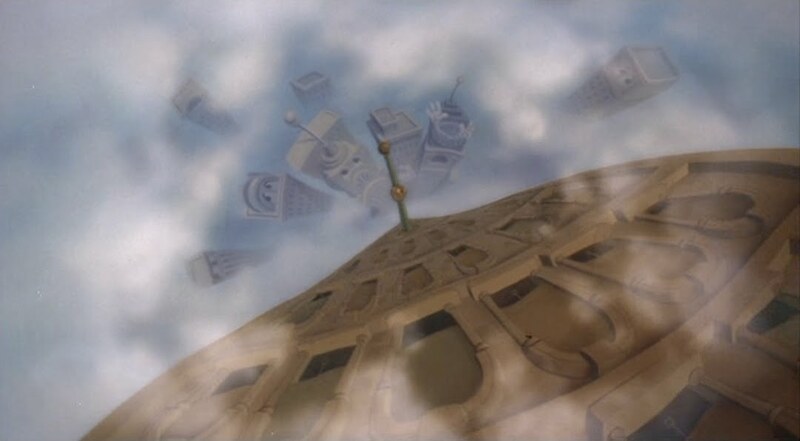 Notice the wonderfully strained expressions on the buildings' "faces." Here's a different view of the street with the "ACME Overused gags" truck. 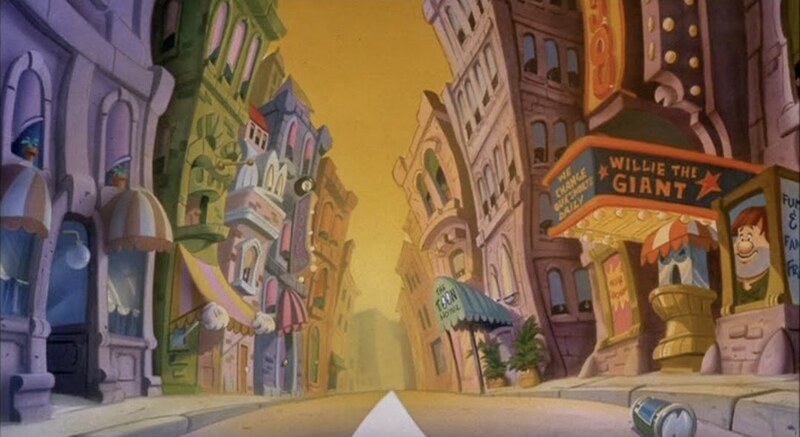 We conclude our visit to Toontown with a long shot of the same street, followed by larger left and right side views. WILL WE EVER SEE a ROGER RABBIT sequel? Unlikely... but here's hoping! 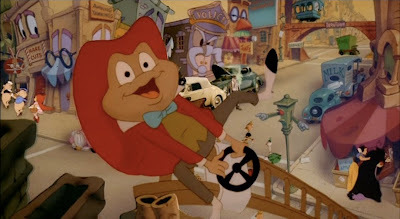 Labels: WHO FRAMED ROGER RABBIT? Great images! Thanks for sharing this material. Amazing. So inspiring to see the quality they hit. Thanks for posting these!!! This might be my favorite thing you've ever posted. Thank you! Yeah...this movie is cool, reminds me some parts of my life. Wow! I never noticed all those faces before, it really is a nice touch. You did forget to mention one hidden face however. 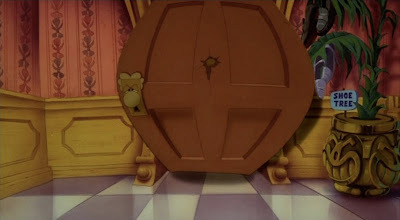 The shot with the door about to burst open, the doorknob is the doorknob character from Alice in Wonderland. 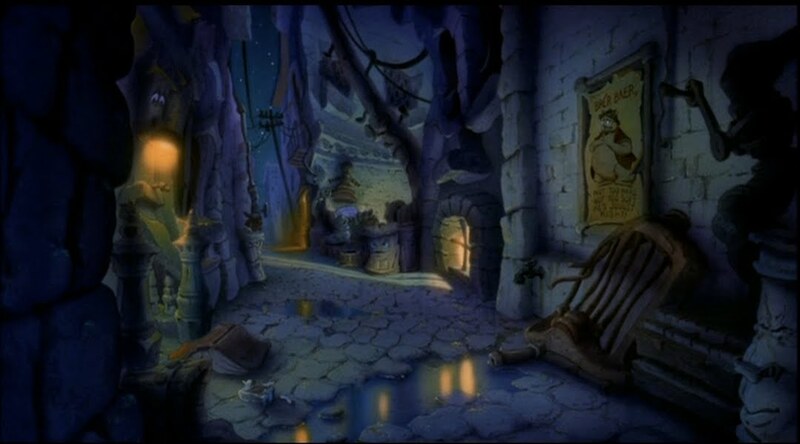 Oh...the backgrounds of this movie are very inspiring to me. Thanks for the post.! One of my all time favorite movies! Beautiful images. Thanks. Wonderful post, Rob! Very in-depth! You should do these kind of analyses more often. By the way, the man riding the horse is Sir Giles from the Reluctant Dragon. Absolutely fantastic post, thank you! I'm gonna watch this again tonight! I've been following your work for a long time and thoroughly enjoy it, but this one is pretty amazing. Thanks for the post. That bedroom painting's no beaver-- it's likeness is none other than (or remotely close to) Screwy Squirrel! He's NOT going to make the toons in 3D thank god! But I wonder where he plans on using mo-cap? 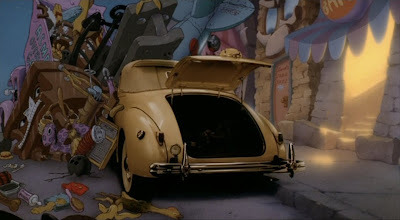 Actually the 'real world' car trunk in some of the screen captures is the car that Roger was locked in the trunk of . . . and Eddie shows up a few minutes later. 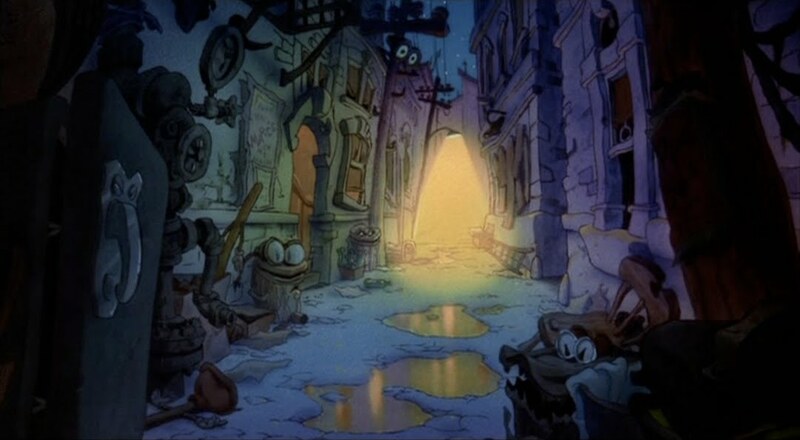 OH and by the way, I was just steered to this site for the first time by an fellow animation fan and know that I'm already in heaven. Great Work! Everyone thinks of this movie as Spielberg, Zemeckis and Disney... no one seems to remember that Richard Williams' studios in England directed the animation. 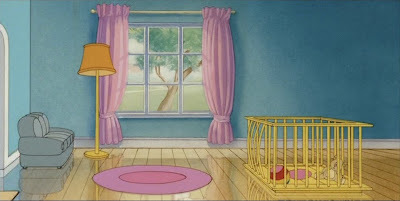 That isn't one of the 3 Little Pigs in drag. It's actually Little Red Riding Hood, from the Pigs sequel, The Big Bad Wolf (1934). Also, the pigs are officially known as Fiddler Pig and Piper Pig. 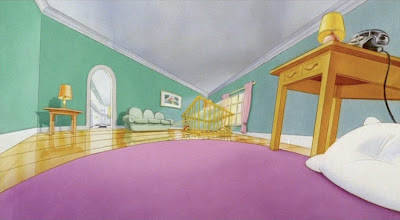 The third, Practical Pig, must be still at home. "These next characters are unknown to me. Anyone recognize them? This pig policeman and all those other little animals. Pigs? A goose? 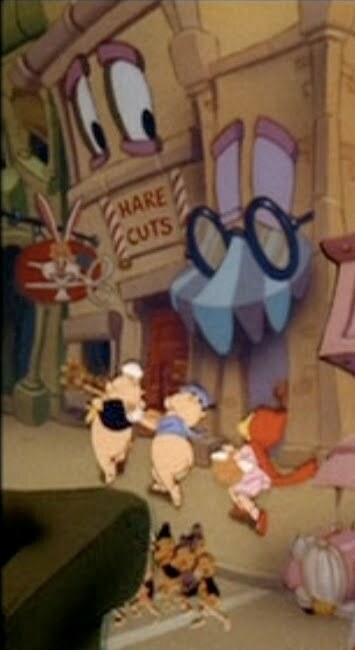 I'm wondering if they might be from the Van Buren studio..."
They are from the beginning animation of the "Tortoise and the Hare", by Disney, 1935. One of my favorite silly symphonies. fantastic backgrounds. 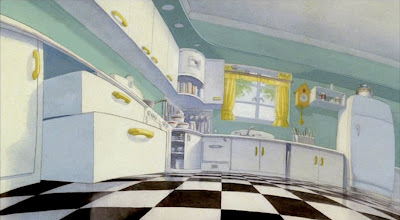 the kitchen scene is very nice. Nice wallpapers. I am looking for two month. Thank you for sharing. Love thos blog! It´s awesome all the art that show us!! Thx 4 this Art Bible! Thank You Very Much for this great information Share with Us.